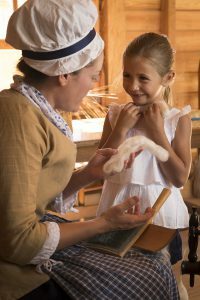 A visitor learns to comb wool at the re-created Revolution-era farm. Just beyond the encampment, the Revolution-era farm evokes the world of the 18th-century family of Edward Moss (c.1757-1786), whose life is well-documented in York County, Virginia, records. Moss and his wife, Martha Garrow, had four children. Though not a landowner, he leased 200 acres from a wealthy cousin and at the time of his death owned six enslaved men, women and children. The story of Edward Moss and his family provides historical interpreters a frame of reference for talking about farm and domestic life as well as the lives of enslaved African Americans during the American Revolution period. Here, Muskovy ducks and hens wander amid the farmhouse, featuring a brick chimney on each end. Historical interpreters will explain the family’s status at the time, given that the modest house has two first-floor rooms, a hall and parlor, each with paned-glass windows, and a second floor for storage and sleeping. Close by, a separate log kitchen allows visitors to learn about period dishes and try their hand at mixing ingredients, some imported and some grown in the nearby kitchen garden. 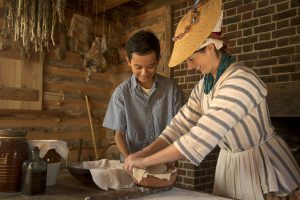 Historical interpreters cook over an open hearth and show how vegetables and herbs were harvested and stored for future use. Making a pie crust in the farm kitchen. A distinctive new feature of the farm is a building to represent quarters for enslaved people, adjacent to a swept yard and small garden. Like the kitchen, it is constructed of log walls and wood clapboard eaves and roof and equipped with a fireplace and stick and mud chimney as well as a storage pit common in this type of dwelling. The farm includes a fruit tree orchard and a field for growing wheat, corn, tobacco, flax and cotton – crops Edward Moss would have sold for cash and used for food, animal fodder and cloth production. In a tobacco barn next to field, visitors can learn about the 18th-month process of growing tobacco, from planting seeds to realizing a profit. Historical interpreters demonstrate tools used for woodworking and processing raw flax and cotton into fiber for thread and display examples of 18th-century fabric dye.